The impermanence of trends is part of what makes interior design so much fun. Over the 40 years we’ve been building homes, trends have come and gone almost as quickly as they appeared. According to our managing director and co-founder Craig Millson, there are four key trends that have withstood the test of time, from the establishment of Orbit Homes in 1979 right up until 2019. 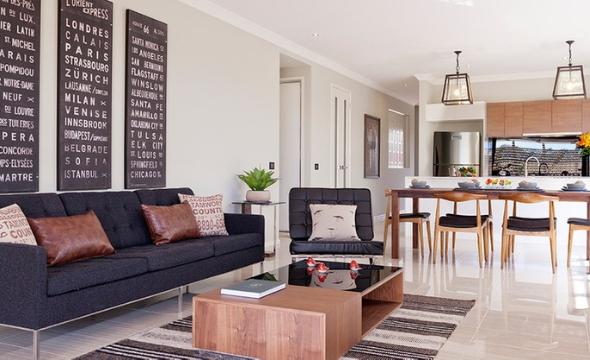 A consistently popular layout in Australian homes around the country has always been open-plan living. “Along with,” Craig says, “the emerging trend of two separate living areas.” Not only does open-plan living give the illusion of more space, as it quite literally opens the area, but this design also allows for one space to act as the family hub. Most often, this is the kitchen. While trends change and adapt every few years, it’s difficult to pick an actual trend that has remained the same. However, Craig says the most dominating trend over the past 40 years would be paint colour. “Walls and ceilings of homes have almost always been painted a crisp white. This is usually to give clients a blank canvas on which to change their home with the trends, such as updated kitchen cupboards and benchtops.” Not just trends, but individual and personalised design choices are incorporated much easier when you have a ‘blank canvas’ to work with. 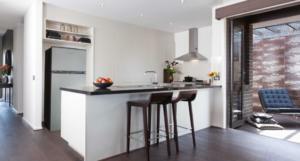 The last two trends that have survived long-term design changes are stone benchtops and timber floors. Craig says these two popular features have been requested continually since 1979, because stone benchtops are hard-wearing and low-maintenance, while timber floors are durable, effortlessly stylish and warm. If you’d like to see any of these four trends in your future home, you can book an appointment online with our Orbit Homes Specialists to talk through the buying and building process.